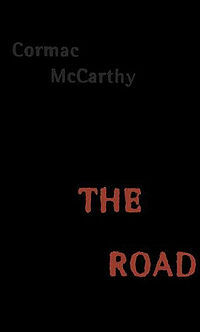 I was going to write a review of The Road, both the book by Cormac McCarthy, and the movie (2009, directed by John Hillcoat), but I then decided not to. Yet, here I sit, trying to come up with something for you . . . and nothing. I am not sure what to say beyond the writing is brilliant, the story stark and depressing and yet full of love with a (very) dim spark of hope. Once I had time to actually sit down and get into it, rather than the stolen reading moments I sneaked in here and there, I was captivated and completely drawn to the story of this young boy and his father as they traveled toward the coast in an inhospitable, post-apocalyptic world. For me, it's impossible not to talk about this novel--or the movie--without talking about the ending. It was an important ending--and a powerful one. I finished the novel while at work, and so didn't have as strong a reaction to it as I might have had I been home, free to feel whatever emotions came. I was able to let my emotions flow after the movie, however, and it was awhile before the tears stopped. A parent dying and leaving behind a child (or a child dying) is a trigger for me. And both the movie and book affected me for days. I imagine they would have anyway, even if I wasn't more sensitive to that particular topic. Still, it was compounded by the recent real life murder of a local police officer who left behind a wife and two children. No matter how hard I tried to block out the thought of those poor kids, I couldn't do it. Although I did not know this particular officer, I have worked with others on the force. We are community partners, fighting the same fight. And so, a few weeks later, I still am not sure what to write about The Road. It's a book I have wanted to read since I first heard the hype when it was published. Then I put off reading it because of the hype. And now that I have finally gotten to it, I find at a loss for what to say--in part, because of the hype. What's there to say about a book that just about everyone has already read and dissected? All I can say is that, for me, this book was more a visceral read than one I analyzed as I read. I liked the movie and felt it was well done, although the book is better. I liked better my own vision of the world McCarthy created rather than that on the big screen. The changes between the two were minor and did not really change the story. Still, the book seems more powerful, more meaningful to me. And yet seeing the story on the screen, brought it even more home for me. I'm not sure I can explain why exactly. To learn more about Cormac McCarthy and his books, please visit the author's website. Source: I purchased a copy of this book and movie for my own viewing pleasure. I really do need to read this but have always been afraid it would be too bleak and dark for me. I'm glad to see you liked it so much. Kathy - It really is dark. You have to be in the right frame of mind to take this one on, I think. I haven't read the book, or seen the movie, but I need to do that soon. In fact, your review makes me want to hop over to the library site and see if they have this one on audio. It sounds too good to ignore! Heather - I'm surprised! I thought everyone'd read it but me. LOL I will be curious to know your thoughts on it if you do read/listen to it, Heather. When books have an impact like that, although it upsets you, it's surely powerful. In a way it gives you a different insight into things, even if you're aware what the aftermath would be like, it makes you look at it in more depth. So while it must have been quite hard to read, I'm guessing it's going to stay with you for a while, and that's a good thing. Charlie - That is so true. The stronger the emotional impact, the more lasting the impression. After finishing the book,I understand more where the survivalists are coming from. Steph - I hope you do read and/or watch the movie. I'd be curious to know what you think--and your children too, if you watch it together. How was it that Florinda put it (about We Need To Talk About Kevin)? The best book I'll never re-read? Something like that. Same goes for this book. It is amazing, but mucky. MacCarthy has probably the most unique literary voice I've ever read. You'd know it anywhere. Sandy - It really is amazing. I may re-read it at some point. I don't know. This is the first book by the author I've read. I haven't had much interest to read his other work, but maybe . . . The Road was definitely a powerful book, a really hard to read but awesome, powerful book. ;-) I haven't seen the movie, but I'd really like to sometime! Megan - Yes, difficult but awesome! I have been so scared to watch the movie. The book punched me in the gut, and I've never really recovered from it. Granted, I read it while on vacation and finished it at the beach. In hindsight, it is not a beach read of any sort. But there is something about the starkness of the post-apocalyptic world McCarthy envisions which I've never been able to shake, even with the glimmer of hope at the end. It's one of the few books which has stayed with me so vividly for so long. Michelle - I really wouldn't blame you if you skip the movie. I think reading the book is enough. I imagine this book will stay with me for a long while too. See and I think you said it just right. The subject matter of this one has put me off; I wasn't sure that I wanted to read something that I knew would be so depressing. But your reaction to it makes me think that I need to borrow my son's copy and a box of tissue. But not at work! Lisa - Thank you, Lisa. I really struggled with what to say. And definitely one better read when alone--or in a safe to cry place! I love Cormac McCarthy but ALL of his books are dark and some of them incredibly twisted. This, was not one of them, but left me depressed for days. I had plans to see the movie but just couldn't bring myself to relive it. Did you read The Dog Stars? I thought that was a more upbeat version of The Road. Ti - This was my first by McCarthy. I did see the movie No Country For Old Men when it came out, but can't say I want to read the book. Maybe. I haven't read The Dog Stars, but you've got me curious about it. I'll have to see if I can find that one. I recently read White Horse by Alex Adams, which reminded me a lot of The Road - especially in it's darkness. This kind of book provokes such a visceral reaction in readers - and they stick with you. I will have to check out White Horse. I like books that bring out my emotions--although lately I've been more in the mood for escape type books. I am glad I read it though. I loved this book and the movie. My son Marc and I both read it and watched the movie together. It created a lot of things for us to talk about. The ending for me was perfect, sad yes, but I'm glad that my heart traveled down the very hard stark Road! Staci - I imagine this would be a great book to discuss. I really liked the ending as well. I don't know that any other ending would have rang true for the rest of the book. I only saw the movie and was so depressed about it. I don't think I could handle the book! Stacy - I know what you mean. I think one version is enough! I started reading this one several times and didn't get past the first 10 pages. I was going through a lot of deaths of friends and families last year and I just couldn't put myself through it. I heard an interview with the author where he talked about looking at his young son and being inspired to write the book. I will definitely read the book when I feel a bit more ready for the tears that I know will come! Kathleen - I can see why this book would not appeal to you with so much tragedy in your life. Timing with this book is important. It's so dark.